Calypso is on the market and ready to meet her new owner! A brilliant example of the sought after enclosed flybridge this 48' Riviera was built to survey for the original owner, and has soo many features it is hard to list them all. 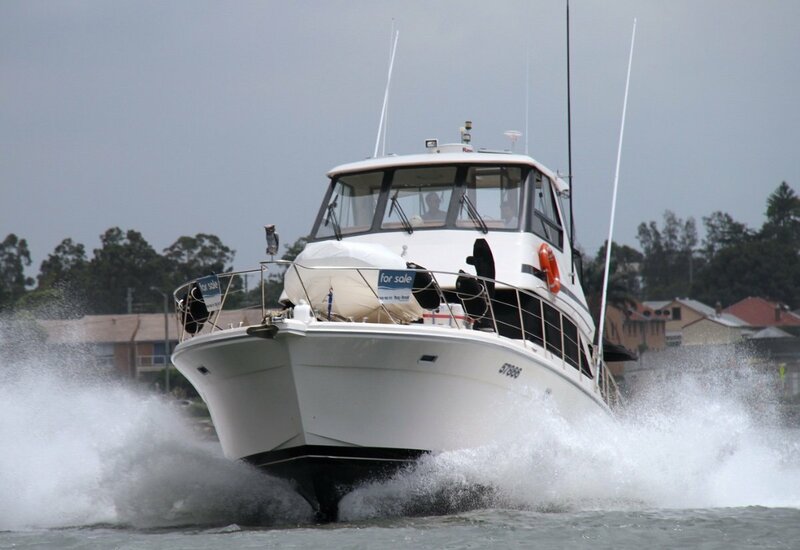 This is a true do-everything boat and is ideal for long range cruising, family holidays, deep sea fishing, living-a-board, pottering around elcosed waters, and just about anything else you can do in a boat. Powered by two CAT 3208 425 HP engines she can hit over 24 knots, and cruises happily at 18 knots, so she can get you wherever you need to go. This boat has 9 batteries, four battery chargers, a generator, 4 fridges, 2 helm stations, and more electrics than you can poke a stick at. To keep everything pumped up and clean there is an aircompressor and pressure washer included, as well as a dyson vacum. The underwater blue LED lighting gives you the full Riviera luxury look when docked in the marina, sipping champagne at the outdoor dining table. The beautiful brig tender is as new and sits in a stainless cradle on the bow, lifted by the folding crane. Its so much fun to drive the owner's kids begged him not to include it with the sale! Never lose a water fight again with the 2 inch layflat fire fighting hose that runs off a dedicated pump attached to the engine! This boat has to been seen to be fully appreciated, call now to book an inspection! Calypso is the ticket to the summer of your dreams, don't miss out. Large Kitchen with 2 burner electric cooktop, Fridge/freezer, Panasonic convection microwave, oven, sink and plenty of storage and bench space. 230L Fridge/Freezer in galley, Fridge in flybridge, 2x U-tech fridges in cockpit, Icemake in saloon. Sleeps 6 adults. Large V berth, Queen master cabin with ensuite, 2 bunks. 3x Auto with alarm, manual, and engine driven. Yes, auto portable extinguisers, firefighting hose with engine run pump. 4x Lifeline 255 amp house batteries, 2x engine batteries, seperate dedicated batteries for Thruster, Genset and radio. (Again, built to survey, 9 batteries!!!) 2800w outback inverter/charger, auto pro amp and auto dolphin battery chargers, blue underwater lights, Air compressor, Dyson vacum cleaner, and pressure washer. This boat wont last long on the market with this list of features! Act quickly and call Tony on 0424842222 to inspect, you will not be dissapointed!